Portable Faradic (CC2345/F) This portable muscle exerciser uses the most modern transistorised circuitry with four outlets feeding eight conductive rubber electrodes through specially manufactured flat connecting leads. Each of these pairs of 3" electrodes has its own individual intensity control and operates totally independently. 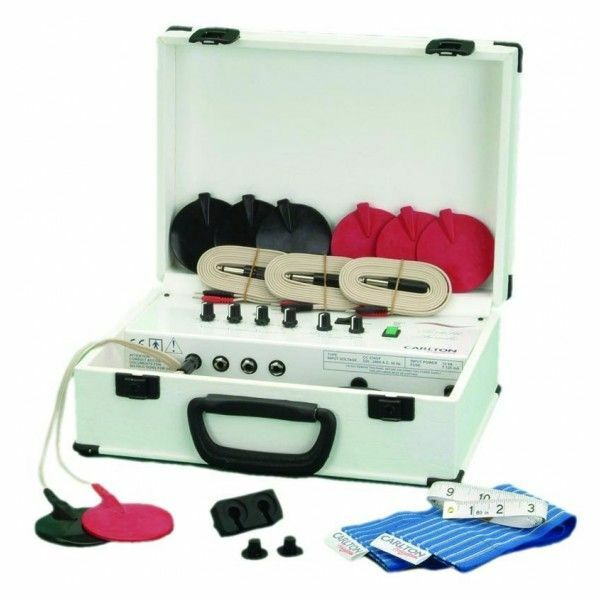 This portable muscle exerciser uses the most modern transistorised circuitry with four outlets feeding eight conductive rubber electrodes through specially manufactured flat connecting leads. Each of these pairs of 3" electrodes has its own individual intensity control and operates totally independently. To simplify operation the faradic muscle exceriser has a suitable frequency and pulse width pre-set in the factory during production. In accordance with the current safety recommendations and to ensure that your client experiences no discomfort this unit incorporates a reset button which prevents its use unless all intensity controls have been set to zero prior to the commencement of a treatment. A facial electrode is supplied with this unit.